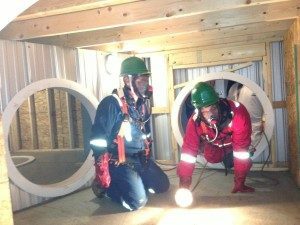 METI’s Confined Space Rescue Training has been developed in accordance with NFPA standards and adheres to NS Occupational Safety General Regulations. Training provides you with an interactive presentation of content and material based on the most recent industry practices. METI provides you with a hands-on, practical confined space rescue training application in our confined space training simulator. You will use all equipment associated with confined space rescue, including the tripod, while donning all personal protective equipment, in order to enter our simulated confined space facility and perform both virtual vertical and horizontal rescues. A Confined Space Rescue certification is required in many work sites, whether for working in an enclosed or partially enclosed area or because of hazards that can occur. 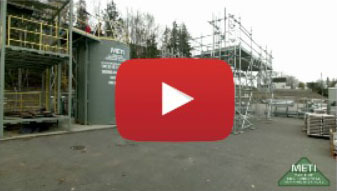 Let METI help you get the training required to be needed on the job site. Confined Space Rescue Training students conducting a simulated confined space rescue at our Sydney campus. Participants must have successfully completed METI’s Confined Space Training, hold a valid Confined Space Certificate and must have CSA approved work boots. Upon completion of this course, you will receive a wallet-size Confined Space Rescue Ticket/Certificate that will show prospective employers that you have the credentials. Prospective employers may require confirmation of your Confined Space Rescue Certificate. We keep your records on file permanently. Feel free to have your prospective employer contact METI to confirm your Confined Space Rescue Certificate. Please contact us at (902) 539-9766, or send us an email at training@metiatlantic.com for more information or to book your seat in our next class. Back to our Safety Training.